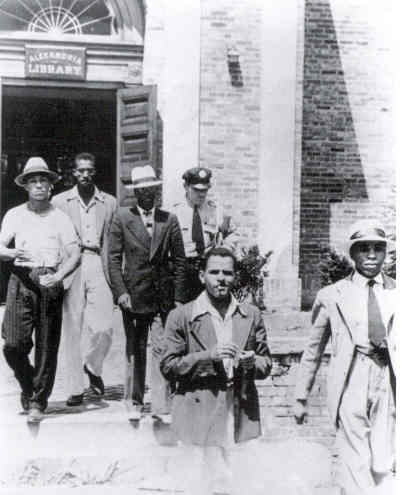 One of America's first sit-ins took place at Alexandria Library on Friday, August 21, 1939. The present-day Barrett Branch Library on Queen Street (originally called Alexandria Library) was the only library building in a city with a population of 33,000. It was built in 1937 with money donated by the family of Kate Waller Barrett (1857-1925). However, as with many public services in the country financed by the community's taxpayers, the library was only available to whites. African Americans, though they voted and paid taxes, were not allowed to use the library. Samuel Wilbert Tucker (1913-1990), who grew up only two blocks from the Barrett Branch, graduated from Howard University and prepared for the field of law. He passed Virginia’s bar exam at age 20, but Tucker, an outstanding student, was too young to be sworn in. A year later, he took the oath. Tucker tried for several years to establish equal access to community resources, but the white community, including the Alexandria Library Board, remained unswayed. In the summer of 1939, Tucker, now 26, developed a strategy by preparing a select group of African American men for a deliberate act of civil disobedience. Ranging in age from 18 to 22 years, these Alexandrians challenged the status quo. On Friday, August 21, 1939, Alexandria Library staff and patrons watched as a young African American entered and asked to register for a library card. When he was refused, he picked up a book, took a seat, and began to read. Minutes later, another well-groomed and polite young adult repeated these actions. This continued until William Evans, Otto L. Tucker (the attorney’s brother), Edward Gaddis, Morris Murray and Clarence Strange occupied five tables. Each one sat in silence and read a book. Flustered library staff called the police. As planned, Robert Strange (his older brother Clarence was one of the silent protestors) ran to Tucker's law office to let him know that the police were on their way. Officers arrived and escorted the protestors from the library, arresting them for “disorderly conduct.” Samuel Tucker had called a photographer, who took a photo, and then quickly arranged for their release. He planned to challenge the city in court on the grounds that all citizens were entitled to equal access to public services. But the city, in an effort to resist integration, stalled the process with intense negotiations. Virtually ignored by most newspapers, the case continued to be widely reported in the African American press across the country. Tucker became seriously ill and was unable to pursue the case. In 1940, community leaders proceeded without the young attorney’s involvement and accepted the promise of a “separate but equal” library. Tucker was infuriated. The Alexandria Library Board quickly approved the construction of the Robert H. Robinson Library, appropriated funding for books, and hired an African American librarian. On February 13, 1940, Samuel Tucker replied to a letter from Librarian Katharine A. Scoggins inviting him to apply for a library card at Robinson Library. Click to read the complete text of Tucker's letter. His strongly worded reply demonstrates Tucker’s commitment to equal protection under the law: “I refuse and will always refuse to accept a card to be used at the library to be constructed and operated at Alfred and Wythe Streets in lieu of [a] card to be used at the existing library on Queen Street for which I have made application." Samuel W. Tucker remained a leader in the war against segregation and intolerance. He argued groundbreaking civil rights cases across the state. He served as the lead lawyer for the National Association for the Advancement of Colored People (NAACP) in Virginia, appeared before the U.S. Supreme Court four times, and was a founding partner in the prominent Richmond law firm, Hill, Tucker, and Marsh. On October 19, 2000, a decade after Tucker's passing, his hometown dedicated its newest elementary school in his honor. The sit-in is chronicled in a documentary called Out of Obscurity. Copies may be borrowed from Alexandria Library. On Friday, August 21, 2009, Alexandria Library hosted the 70th Anniversary of this first civil rights sit-in. Throughout 2014, Alexandria Library hosted events honoring the 75th anniversary of the peaceful protest.